When it comes to selling frequent flyer miles, US Airways has been among the most aggressive airlines, routinely offering significant discounts on the purchase of miles in its Dividend Miles program. This latest promotion takes a slightly different tack, promoting the exchange of hotel points for US Airways miles. So, an elite member who has a Dividend Miles-linked credit card would earn the full 75 percent bonus. Participating hotel programs: Accor Hotels AClub, Best Western Rewards, Choice Privileges, Carlson Gold Points Plus, Hilton HHonors, Hyatt Gold Passport, Marriott Rewards, Priority Club Rewards, Starwood Preferred Guest, and Wyndham Rewards. Do you have hotel points? 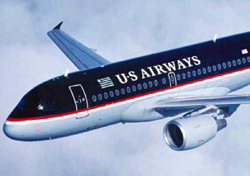 Do you need US Airways miles? If you answered yes to both of the above two questions, this offer features uncommonly generous exchange rates, especially if you’re an elite member of US Airways’ program or have their credit card. And if you have Starwood Preferred Guest points, the deal is better still. Starwood famously adds a 5,000-mile bonus for transfers of 20,000 miles, so combining that with the US Airways bonus could generate as many as 43,750 US Airways miles in exchange for 20,000 Starwood points. Ultimately, the value of this promotion turns on the value of US Airways miles. How much are US Airways miles worth to you? More or less than miles in other airline programs?